Artist’s commission opportunity to celebrate Bee Lady and city’s elderly. 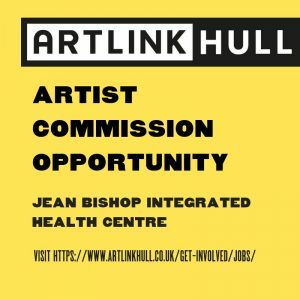 Artlink are looking to commission an experienced artist to develop, create and deliver a high quality artwork to celebrate Jean Bishop and Hull’s older community, to be located at the Jean Bishop Integrated Care Centre in East Hull. Established in 1982, Artlink Hull has continually been involved in the development of socially engaged art practices, and remains a key organisation in the Humber region working in this sector. The Jean Bishop Integrated Care Centre, named after the city’s famous ‘Bee Lady’, is designed to provide a whole range of services allowing patients to be referred from their GP for assessment, then receiving a managed treatment programme for long term conditions. The centre predominantly treats the over 55’s. “The art commission will be an exploration and celebration of what older people contribute to society, with Jean Bishop as the inspirational figure. We want the work to reflect the experiences of the older generation in the city, and to express their perceptions of ageing and what older people contribute,” says Artlink’s Jemma Brown. Please submit your proposal with supporting information by 5pm on Friday 16th November 2018. For completed proposals or if you have any questions about the commission, please contact Jemma Brown on jemma.brown@artlinkhull.co.uk or 01482 345 104. Be the first to comment on "Artist’s commission opportunity to celebrate Bee Lady and city’s elderly."